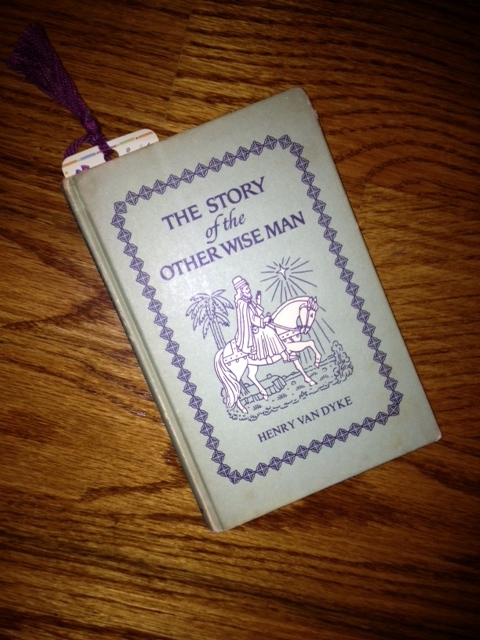 I guess it was about two years ago that during one of our conversations on life and stuff, my Daddy said, “Tara, get that book off the shelf and take it home and read it.” A copy of The Other Wise Man by Henry Van Dyke, first published in 1895. I took it home, but it took all this time before I opened it and entered the world of Artaban. Artaban was a Magian, and he, along with the other three Wise Men, were convinced that the King was about to be born. Artaban set out to meet the other three wise men, so they could travel together, following the star to find the baby who would save us all. On his journey, he was waylaid by helping others—albeit struggling with the conflict of making it in time or acting in love at a time when he was needed. Artaban let himself be interruptible, and he changed lives. He was too late to meet the other three, and Artaban spend the next 33 years looking for the one born to be King. At one point he finds himself in Alexandria, taking counsel with a Hebrew rabbi. The rabbi read from parchment prophecies of Israel and shared the words which foretold the sufferings of the promised Messiah—how he would be rejected and despised. p. 59: “And remember, my son,” said he, fixing his eyes upon the face of Artaban, “The King whom you are seeking is not to be found in a palace, nor among the rich and powerful…..But this I know. Those who seek Him will do well to look among the poor and the lowly, the sorrowful and the oppressed.” And so Artaban continued to seek the Messiah, searching among the hungry, the poor, the sick, and the prisons. And though he found none to worship, he found many to help. Without spoiling the ending of this precious tale of hope and giving, know that Artaban does in the end, find the Messiah he has been seeking, but not as one might expect. Are you willing… to believe that love is the strongest thing in the world— stronger than hate, stronger than evil, stronger than death— and that the blessed life which began in Bethlehem nineteen hundred years ago is the image and brightness of the Eternal Love? Then you can keep Christmas. And if you can keep it for a day, why not always? But you can never keep it alone. Keeping Christmas. Always. I think this is what Artaban, the other Wise Man, did. And I am blessed to know and love friends and family who also keep Christmas everyday. Mama and Daddy believed in this, as I watched them spend their lives giving to those who couldn’t say thank you and helping those in need. Just the other day, I watched as my friend did laundry, just as she does every week, on her day off from her world…..laundry for folks who may not have washed for quite a while, folks who don’t have washers, dryers, showers, beds, or even roofs. And she does it with love and a smile on her face. I have a friend who spends days on end, at the hospital loving and comforting a newborn with health issues, this tiny one who is only content when being held…..this baby that won’t go home with her, as she is the one caring for this little one before she goes to her adoptive home. Yet she loves. My sister takes valuable time away from her job each week to read with a child in need at her son’s school. A little girl with the wiggles, who can’t sit still and struggles to read. Yet my sister loves. I am blessed to know teenagers who spend their time, when they could be doing so many other things or nothing at all, remembering how many creams and sugars a person who is homeless takes in his coffee or whether or not he prefers marshmallows in his hot chocolate. And they do it with a smile and love. My friend, who takes her own time to show hands patiently, big and ever so small, how to knit—so patient. And she does it in love. Those friends and family who reach out with light and love in the darkness of others, sending the right word or book or hug just when it is needed the most. Keeping Christmas. Every day. Each one of them. Making their lives interruptible for others. Daddy, like his Granddaddy before him, liked to keep these soft peppermints, that we see so much at Christmas, around all year long, something that made them both especially popular with the younger set. After reading the story of Artaban that Daddy shared with me, I remembered these peppermints and smiled. I think it might just have been their way of remembering to keep Christmas everyday. May we all continue to seek the Messiah, and never forget to look in the faces and hearts of those around us. Merry Christmas!